Karen (not her real name), admitted to single handedly destroying her marriage with passive aggressive coldness, destructive words, and disrespect of the worst kind. After her husband walked away from the marriage, she had a Holy Spirit moment and completely changed. She felt conviction over what she had done, her heart softened, and she vowed never be that woman again. Karen had a beautiful holy glow of a woman who knew she was totally forgiven and completely loved by God. Miraculously, her ex-husband saw the change, and the marriage was restored! However, after a few years, the destructive behavior began to creep back in. A retreating into self for weeks at a time. Ten years after the miraculous restoration, the marriage crashed and burned. Jesus saw this tendency to fall into old ways when he cleaned out the temple. In the beginning of his ministry, after his first of miracle of turning the water into wine at the wedding of Cana, he traveled to Jerusalem to celebrate the Passover. Three years later, during his last week of life on earth, Jesus came upon the unholy mess again. How did the corruption happen the second time? I don’t think it happened all at once. After Jesus cleared out the temple initially, I suspect it stayed that way for a time. But one day, a moneychanger set up his table. Then another brought in a few birds, followed by a couple of sheep, and then here came a cow. The next thing you know, the temple wasn’t any different than it was before Jesus cleared it out and cleaned it up three years earlier. In three years it had reverted back to an unholy mess. Sometimes I am that messy temple. Swept-clean sinful behavior, ungodly thoughts, and jump-off-the-cliff emotions are itching to creep back in at all times. It is up to me (and to you) to keep the temple clean. Perhaps you’ve had a Holy Spirit moment as some point in your life—a moment that caused you to make a major lifestyle change. But for the moment to maintain momentum, we need to be constantly aware of our tendency to revert…to go back to the way we were. I am so thankful that Jesus went back to clean out the temple a second time. It lets me know that he will graciously return to my messy self again and again with broom in hand. Today, think back to a time when you made a decision to change something in your life: a bad habit, an ungodly behavior, a destructive relationship, hurtful words, overeating, the abuse of alcohol, disrespect to your husband, yelling at your children, bitterness toward someone who hurt you, etc. Have you allowed any old ways or attitudes to creep back in? If so, simply ask Jesus to come and clean out the temple…again. Then cooperate with Holy Spirit to keep your resolve. I don’t know about you, but I never want to go back to the way I was. Check out these resources to help you let go, move forward, and live bold! God create in me a clean heart, I am doing it today. Create in me a clean heart , starting fresh! I’m doing this today. Create in me a clean heart Lord. I don’t want to go back to where I was.. I feel myself creeping there! I keep going around the mountain again and again! This devotion was perfect for me! I need to trust God and let go of my life and believe God has a beautiful plan for my life! Starting Fresh .. I can do all things through Christ Jesus! Today I was praying to God asking Him to Forgive me once again for going back to the way I was to the sinful nature and in a silent voice I heard Him say go and search for Sharon Bible app , I had no Idea what He had in store for me Until I found a link to this page and I started reading this and it speaks exactly to what I have been going through and praying for this morning. I do not want to go back. I want to grow in faith and be a living testimony and share the word and live the life that God has purposed me for.and I realise I will never live that life if I keep going back. Today I trust God that He will create in me a Clean heart and renew my spirit and mind. As I also keep reading and staying connected to you Sharon as I believe it was not a coincidence to find this post but God directing me to new life. I am looking forward to growing in faith through your posts. God bless you. I’m doing it today. Thank you for your wonderful inspirational teachings. Thank you for the message this morning. I’m doing it today!! !right now! Thank you Sharon for this post, I have been letting old habits slip back in ie alcohol I feel like such a fake! But I so want The Lord to clean me up! I thank God for his unending love & mercy! Praise to God for making all things new again – even us! Your words were just what I needed to hear this morning. Thank you. Thank you for sharing. I get frustrated when the “old” creeps back in. Sometimes it happens before we even realize it. Thank you for pointing out that this is a normal part of our journey. Instead of getting frustrated, I am asking God to remove those old things that sometimes creep back in. Thank you for sharing your thoughts. God spoke to me through your words. God bless you. Thanks for the reminder to stay steadfast. I’m doing it today. I changed my eating habits to much healthier ones this summer, and I’m eating poorly again and putting the weight back on. I ask for prayers to be obedient to our Lord again and take care of this only body he gave me. Amen!!! I will be praying and agreeing with you. I need help with the same issue. As a familiar song says ” For His grace is sufficient for every need and His love is so abundant and free…” I do this everyday many times a day, the changing of the heart. The potter molds me, smooths away the ridges and crevices of a life filled with hurt and fears and trials into new mercy as His Word says every morning. He creates the space and the waiting, ah the sweet waiting for it’s there I meet my Savior who is changing this life beyond the Old rugged Cross where He nailed my lesser self to Himself. What a mighty God we serve! Praise Him! I’m doing it today! ❤ ? I Am Doing This Today: Asking God to clean out my temple. Today I come asking You to sweep my temple clean. I’m tired of giving and taking back my same old habits of becoming angry when things don’t go as planned in my life. I release these things into Your Trusting Hands and ask that Your Sweet Holy Spirit keep me on the right side. Forgive me of my sins and Thank You for who You Are to me; Lord of my life and of this world. This one really hit home. There are lots of things that I “go back to” after resolving to make changes – eating, time & commitment to family, and using time better. Today my focus will be on cleaning the temple and focusing on not going back to the way things were. I am making good choices but need God to guide me and keep me on track. Beautifully written, Sharon! Your insights help to keep me in the right frame of mind. In August, our city was flooded and 90% of our people were affected. It is a daily decision to keep walking in the faith as we all rebuild our homes and our lives. Father God has remained faithful through it all. People are important….not things. I have seen the Holy Spirit in action in our community as we help one another. I pray that this same spirit of harmony stays with us….that we don’t forget….that we continue to be that light on the hill for all. What a powerful story. You are loving one another and I think of 1John. Thank you Sharon for the insight. I also had braces when I was younger and some of my teeth have gone back but I thought it was because of an accident many years ago where I had broken my jaw and it had been wired together. I thought perhaps the wiring had moved them around. But the teeth did go back to exactly the way they looked before braces. This visual also helped me see in my spiritual life where old habits die hard. I do see I can only overcome with the One that overcame! Thank you for sharing your insights given by Him. May God continue to bless your writing. Wowza, Sharon your story today really resonated with me . I’m doing it today! Thank you for all you do and write to bring God’s word to life for all who stop to read it. May you and your family be especially blessed throughout this holiday season. This is a very timely word for me today! God is always on time! Thank you for this word of confirmation & encouragement. I wake up every ( well most ) mornings eager to read my Girlfriend in God’s devotion. Thank you!! It has helped me through some pretty trying times. God is good!! I try and share to others how meaningful and helpful your stories and lessons are!! Just wanted to let you know. And so wish I could meet you all some day! And your cruise comming up in Feb. sounds like a dream come true?. Hope everyone is blessed and has a wonderful time. Thank you for this post, Sharon. Words we all need to hear. I’m doing it today. Thank-you so much for this blog. Thank you for this blog I’m doing it today. I thought I was alone in dealing with this. I even stopped going to church because I thought that I wasn’t good enough. The shame of stumbling on the same areas drove me away until I couldn’t being myself back in. Thank you for this. I know I need a lot more encouragement in this area. Oh sweet friend. Don’t let the devil tell you that you are the only one! We all struggle with this one. I’m doing it today and sharing this with others! Thank you for the reminder. Thank you for being a useable vessel by God. I am doing it today!!!!! I am doing it today!!! Thank you for this article. I am doing it today. I am doing it today! Thank you for the article. I needed to read this today. Thank you Sharon! I’m doing it today! This hit home today! Starting work on this TODAY! I am doing it today!! My heartfelt prayer is that I don’t revert to the same sinful behaviour – that I will be ever cognizant of never going back. I am so thankful the Lord keeps giving me another chance. Overeating, emotional eating, junk food. Huge struggle. Need to remember to ask the Holy Spirit to help keep his temple clean. Our God is so timely. Your message today spoke volumes to me. Saved by grace in 1978 after being married, divorced, and remarried to the same man. We will celebrate 48 years in 2017. It is only because I keep my eyes and heart focused on the Lord and not on the things of this world. I falter many times but I look at myself in the mirror and denounce Satan and always call out to our Mighty Father. He is always there as well as my wonderful Christian sisters in Christ that I can have prayer with at the moment I pick up the phone and make a call. Praise God for His provisions and unmerited favor on all who call upon His name. Blessings on your day and this beautiful Christmas holiday season. I went through a very similar experience in my marriage and life as “Karen”. Our marriage was not restored. But God has healed and restored me. I did have that Holy Spirit moment. And I don’t ever want to go back to the woman I created. I am becoming the woman who God created before I was even knit together in my mother’s womb. When I see the old person begin to raise its head, I am aware, I rebuke and I ask God for forgiveness. I never want to go back to that place of bitterness, resentment, anger and ugliness. I want to radiate Jesus wherever I am. Last night at choir practice that ugly old self started to rise up! I saw it and prayed against it and God graciously touched my spirit. Thank you for the timeliness of your words today. I so needed to be reminded of what I have been healed from and where He has me now. I made the decision to clean out my temple……again over the weekend. With God’s help I will recognize early when I am slipping back into my old sinful ways. Praise God, He is merciful and forgiving. He’s the God of second chances! Thank you for today’s message! I’m doing it today and passing it on! I just did it! !God always brings me the right message just when I need to read it. My heart needed to hear that today. I’m printing what you wrote so I can refresh my memory from time to time. Thank you for sharing God’s Word with us and making it practical with the examples! It’s like you’ve been privy to my most private moments with Jesus…exactly what I needed today. Thank you for being willing and obedient. Thank you Sharon for the reminder that God gives us second chances- and sometimes we need to be reminded to go in and “clean up” old habits that have crept back in to our lives. Destruction is not always a Big Bang or castostrophic event- most times it’s a gradual erosion caused by bad habits or words- and like any other habits- sometimes we need to go back in and reconcile or take things back to the beginning. There is no sin that is greater than God’s grace. I’m amazed that He continues to forgive me. I guess that why it’s called AMAZING grace! God was speaking directly to me with this. I told Him this temple was dirty and asked Him to clean it. I just “met” you through proverbs31ministries last week. I really needed your words about shame. I am so amazed everytime God puts exactly the right message in front of me. I ordered 2 of your books right away and now again today God spoke to me through you. I appreciate your faith and your words. God needed to help me see truth in the midst of my struggles and He used you as His tool. Thank you for being His willing vessel. I look forward to reading your books. It is so great to “meet” you. God is so good to give us what we need when we need it! thank you. I needed this today. My heart feels a heavy burden and I am not sure why. I am asking God now to help me. Will you [ray for me too? I’m doing it today! Thank you so much Sharon. God bless! I really needed this today. I’m doing it! I’m dying it Today!!! Thank you Lord!!! I am doing it today. Thank you Sharon! Thank you for being a blessing to my life. I pray that God will give me a new memory to do what brings glory to his name always . This truly blessed me…..thank you for allowing God to give you a much needed word and for passing it on. I’m doing it today. Create in me a clean heart O God. I’m doing it today!! Thank you for this reminder! Sorry reading this post late but I’m doing it today, sometimes we have to be reminded. Thanks and God bless each of you. I’m doing it today!!! Thank you SHARON ? I am doing it today! Asking God to create a new refreshed clean heart with a fresh spirit! Oh, I so look forward each day to see what the girlfriends are going to say! Always something I can use, it applies directly to me or my situation, and often I will just sit at my desk at work and quietly cry! Crying is really not encouraged at the workplace, so I try to reign it in…Thank you for all you do each and every day to help all of us with our issues! At times I wonder if you have been to my house, you seem to hit things right where they need to be hit! Be blessed, not stressed during this most wonderful time of the year. Since my name is Carol! this is one of my favorite times of the year! Love you all. Yes yes and amen…. never realized this truth… resist the devil and he will flee from you and draw near to God and He will draw near to you…this has to happen 24/7. I needed to hear to that to be sober of mind and to be careful. Because I do see sins creeping up again that I felt I conquered before. GIG thanks ?? definitely had to meditate and sit with God on this one. i am doing that today ! yourself and honest about your life situations and how He has helped you!! I always love your posts Sharon. They are so timely for me. Thank you for your transparency and truthfulness! I am “doing it” today. Keeping my heart clean and NOT going back to old ways. Blessings. I am doing this today! After a very painful divorce (which still has many consequences today ) I allowed myself to love someone again. But I am so afraid of being hurt again that I am not into this relationship. Thank you, Sharon! This is EXACTLY what I needed to hear today!!! I sat down to pray & spend time in the word before I corrected my husband…again, and the Holy Spirit put a holy muzzle over my mouth! Bless you for this post! I will be returning to it time & again! Thank you for reminding me to not slip backwards! Thank you, I have a blessed marriage. Now I have a heads up on what to watch for. I will pray for the Holy Spirit to help me keep His temple clean. I’m looking for the free downloadable praying for your husband head to toe from the proverbs 31 devotion. Here it is. We had a glitch! By God’s grace I’m doing it today! Yes Lord today cleanse My temple of all things not of You. I’m doing it today! Please Jesus, clean out my temple of all things not of YOU!!! Please, Lord, do it today in me! Sharon Jaynes, I just love your posts! This message spoke so loudly to me. I am going to copy it so I can reread it every few days to help me remember to not go backwards. My husband and I are separated at the moment but I am praying and believing God is going to heal and restore my marriage. God gave me hope through you words. Thank you!! So many times I’ve’gone back to the way it was’ and so many times I’ve caught myself and asked God to forgive me and give me a fresh start. I’m so very thankful for a merciful God who not only understands but lovingly gives me second chances. Heavenly Father I’m thankful that you never give up on me and that you love me enough to keep giving me second chances. Keep my eyes and heart focused on you and your unconditional love for me. 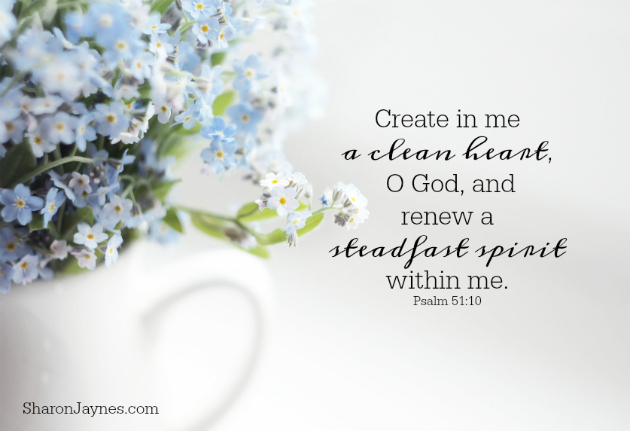 Create in me a clean heart, O God! I’m doing this today! What a great reminder! Thanks for your obedience. I’m doing this today! Thank you for the reminder to ask God to search my heart daily. I am doing this today! Create in me a clean heart O God, and renew a steadfast spirit within me. Amen. I am behind on some of my devotional emails. God knew I needed to read this one today. I’ve been mulling over in my mind some of the things that I’ve been going backwards on… Like my healthy eating, exercise and personal devotional time. And WHAM! I read this one today.. God is always and ON TIME God! He gives us what we need WHEN we need it. So, this has blessed me to get back to it and to reign myself back in! Thanks for allowing God to use you to bless others. “I’m doing it today! Lord, Jesus just sweep away!